Queen & Sherbourne - 3 Towers - 39, 45 & 39 Storeys! Queen & Sherbourne is a new mixed-use condominium development currently in pre-construction at 245-285 Queen Street East, 8-12 Brigden Place, 78-106 Ontario Street and 348-412 Richmond Street East in Toronto, Ontario by ONE Properties. 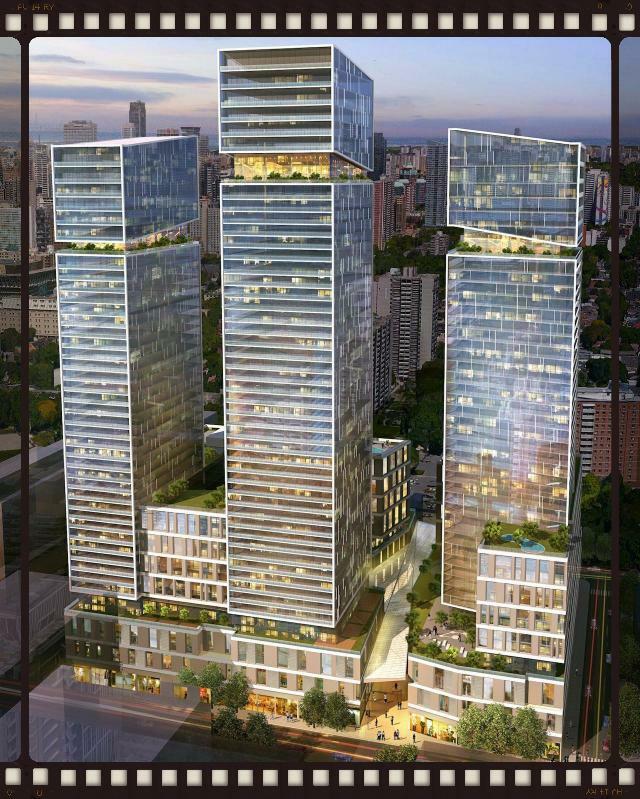 Designed by three architectural firms, this proposed development consists of three towers that are 39, 45 and 39 storeys in height with a total of 1,654 residential suites. 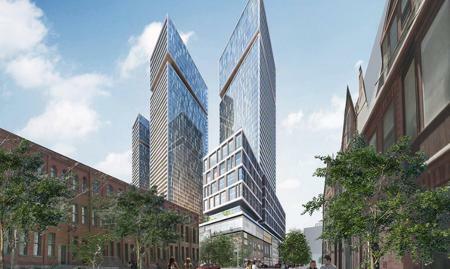 Queen & Sherbourne Condos is a proposed development with residential and retail uses that will see three towers of 39, 45 and 39 storeys on top of two base buildings ranging in height from 3 to 11 storeys. 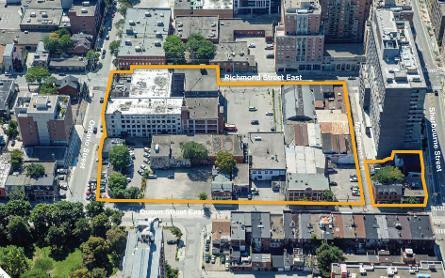 This site is bordered by Queen Street East to Ontario Street to Richmond Street East and to McFarrens Lane. 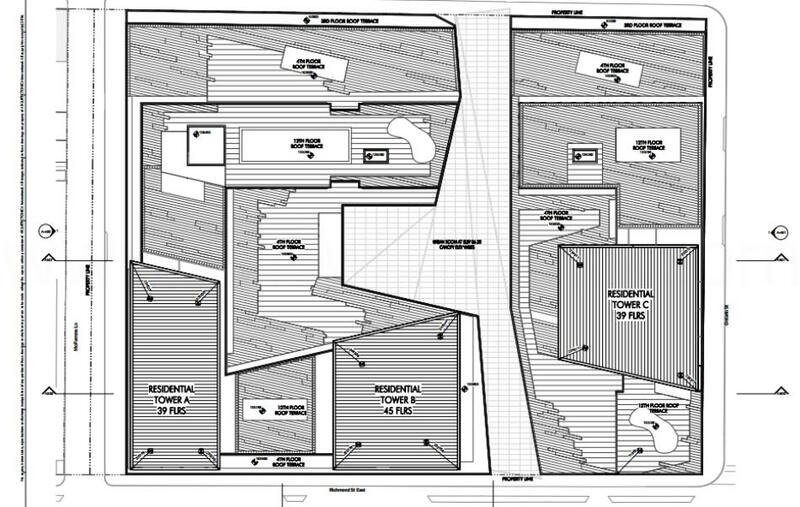 Total residential suites proposed is 1,654 of which 1,172 or (71.2%) are one-bedroom units, 304 or (18.5%) are two-bedroom units and 169 or (10.3%) are three-bedroom units. Total gross floor area is 153,141 square metres, of which 121,563 square metres is total residential gross floor area and 31,578 square metres is total retail gross floor area. Tower A is the 39 storey (151.5 metres in height) building on the west block with a total of 747 units of which 551 will be one-bedroom units, 154 will be two-bedroom units and 42 will be three-bedroom units. Tower B is the 45 storey (169.8 metres in height) building on the west block and both Tower A and Tower B are on top of a shared building base which ranges from three storeys to eleven storeys in height. Total dwelling units is 363 of which 231 will be one-bedroom units, 67 will be two-bedroom units and 65 will be three-bedroom units. Retail use space is proposed on the first three storeys and the building façade of 263-265 Queen Street East is proposed to be incorporated as part of the development. Tower C is the 39 storey (151.5 metres in height) building located on the east block on top of a building base ranging from three storeys to five storeys in height. Total dwelling units is 535 of which 390 will be one-bedroom units, 83 will be two-bedroom units and 62 will be three-bedroom units. Retail use space is proposed on the first three storeys and the building façade of 78-82 Ontario Street, 90-98 Ontario Street and 410-412 Richmond Street East are proposed to be incorporated as part of the development as well. a future growth area to watch for. Read more about UrbanToronto's Development Guide: Growth to Watch For 2016 Series - Jarvis & Church Corridors. Queen & Sherbourne Condominiums will have four levels of proposed below-grade parking for 1,082 vehicular parking spaces of which 587 will be for residents and 495 will be for retail. Total bicycle parking spaces proposed is 2,010 of which 1,580 will be for residents, 250 will be for visitors and 180 will be for retail use. There will also be 13 loading docks proposed for this development. Total amenity space proposed for the Queen and Sherbourne Condos is 7,280 square metres of which 3,823 square metres is indoor amenity space and 3,439 square metres is outdoor amenity space. Tower A will have 3,579 square metres of indoor/outdoor amenity space, Tower B will have 1,138 square metres of indoor/outdoor amenity space and Tower C will have 2,545 square metres of indoor/outdoor amenity space. Register with us today for more information on the Queen & Sherbourne Condos by ONE Properties! Queen & Sherbourne Condos Floor Plans and Price List will be available soon. Please call or complete the registration form to get all the info and to register now for the Platinum VIP Preview Sales Event. For more information, please register today for the Queen & Sherbourne Condos.